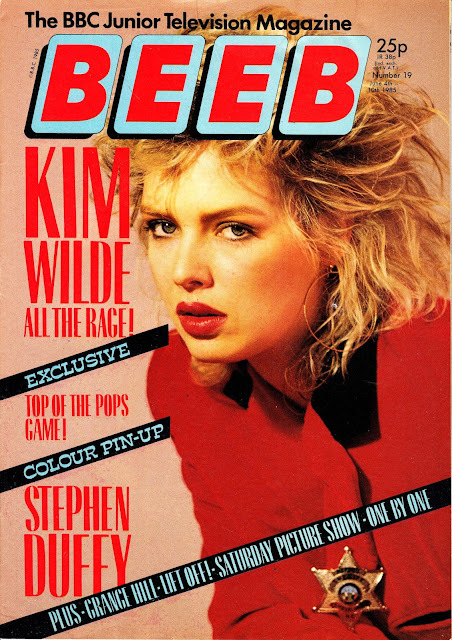 From 1985: the June issues of BEEB magazine, the BBC's not-long-of-this-earth rival to LOOK-IN. Only two issues in June? Yup, without warning publisher Polystyle pulled the plug after only twenty weeks on the shelves, presumably having been underwhelmed by the early circulation figures and concerned that sales would only slump further over the long summer with more outdoor distractions, and less top-notch telly, available to kids. There's already a sense, just by looking at the last few covers, that the editor was trying to move away from a heavily reliance on BBC properties (many of which had already gone on summer hiatus) to the more rock solid, year round, appeal of pop people.